When my mother‘s mother was a baby, she attended the ceremony unveiling the Brooklyn Bridge and was carried across the bridge in her father’s arms. 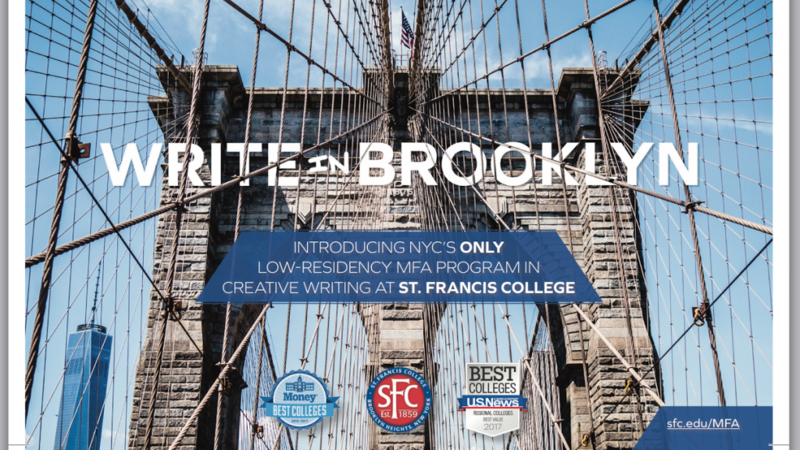 That’s only one reason I am so thrilled to be joining the new low-residency MFA program at St. Francis College in Brooklyn Heights, just across that same bridge from Manhattan. It’s the first low-res program in NYC and a very sweet community—and based on my decade of experience directing the Stonecoast program, I can tell that St. Francis is doing things right! Please spread the word about this great new program. I’ll be there at the first residency July 5-15 2017 and I hope some of you may decide to join me!